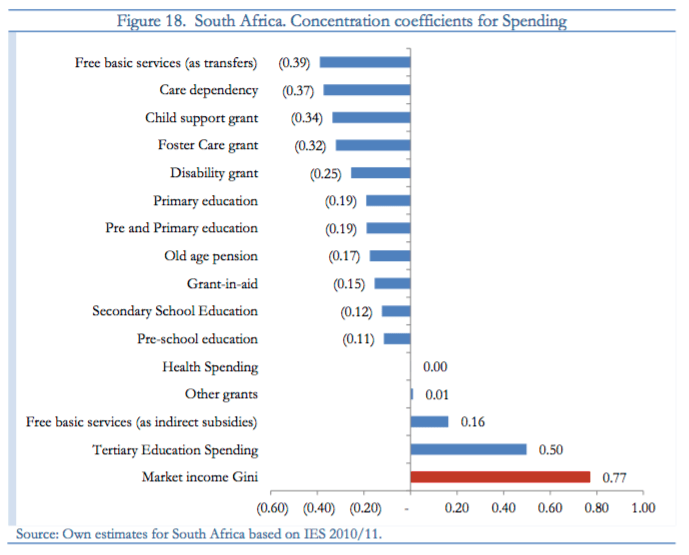 After two decades of democracy, economic inequality in South Africa remains very high. 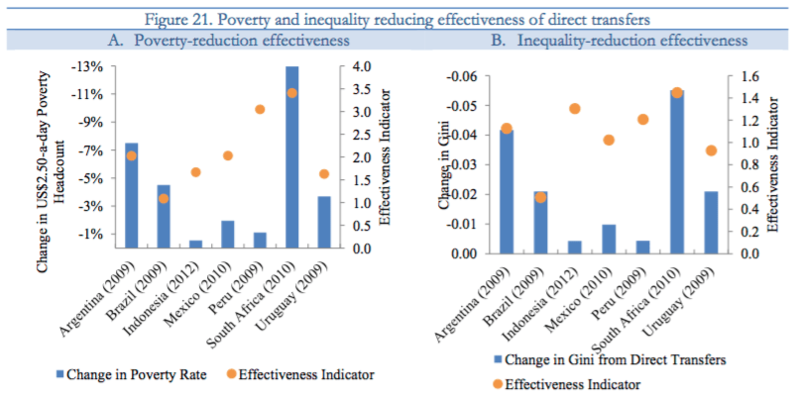 Survey comparability issues make analysing trends tricky, but it is clear that overall income inequality has not fallen; the country has long been one of the highest ranked by Gini coefficient, a widely used measure of income inequality. Its peak of about 0.72 in the late 2000s is one of the highest ever recorded. 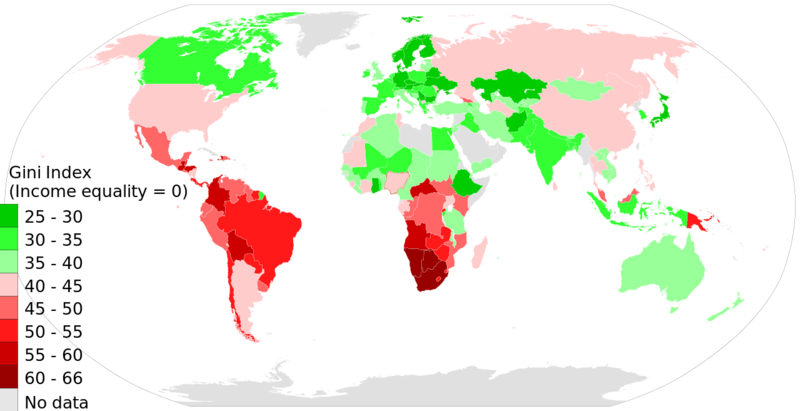 As an aside, I’ve explained the GINI coefficient in this post: That Gini Might Give You A Headache. But, really, the important thing to know is that the Gini is a number between 0 and 1, where “0” is perfect equality (where everyone earns the exact same basic income), and “1” is perfect inequality (where only one person earns all the income). 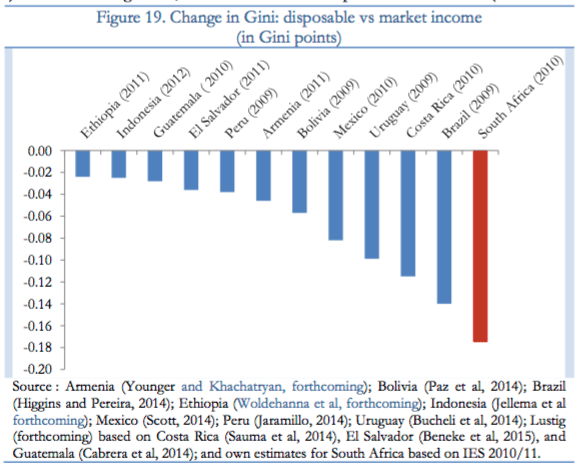 So the closer the Gini is to 1, the more unequal things are. So, you know, not good. Except that this map only shows pre-tax income inequality – it does not take into account the impact of progressive taxes, wealth transfers, and all the benefits that are supplied through government efforts to address income inequality. *I keep referencing the Davis Commission because that process is rather firmly operating in favour of a more leftist approach to tax collection – which at best makes them neutral about the impact of wealth transfers; and at worst, incentivises them to understate their impact. So I’d rather use their numbers than those from any studies generated by the anti-tax groups on the Right. So putting the impact of free basic services aside, the after-tax income of the poorest decile is increased by around 10,000%, while the after-tax income of the richest decile is reduced by almost a third. And that’s after all taxes, not just personal income tax. 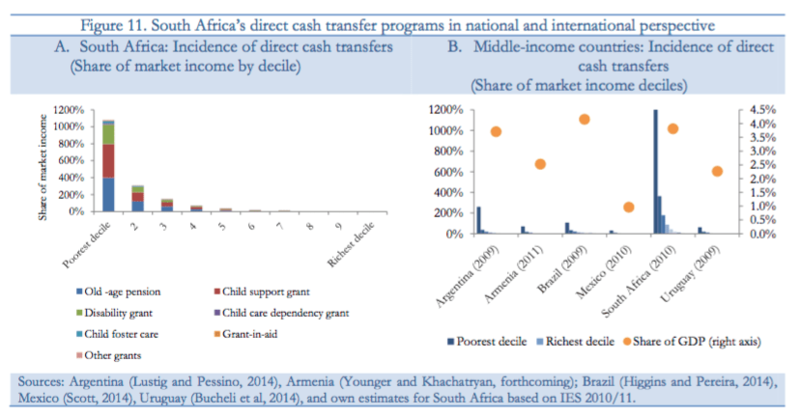 In sum, for the fiscal instruments we examined the South African fiscal system lifted some 3.6 million individuals out of poverty when measured as those living on less than US$ 2.50 per day (PPP adjusted). 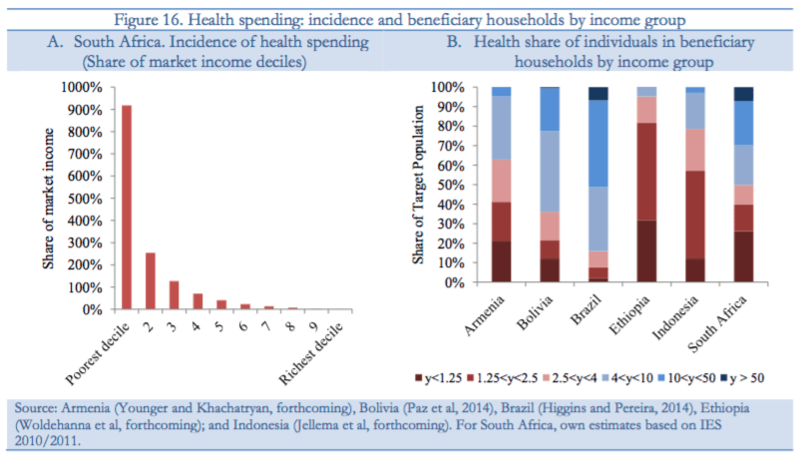 When taxes and all social spending that we examined are combined, the gap in incomes between the rich and poor goes from a situation where the incomes of the richest decile are over 1,000 times higher than the poorest to one where they are about 66 times higher. The thing is: I’m not trying to say that we’ve fixed inequality, or that we’re not doing enough, or that we’re hitting the Goldilocks “just right” temperature of redistribution policies. I think that is a different conversation. 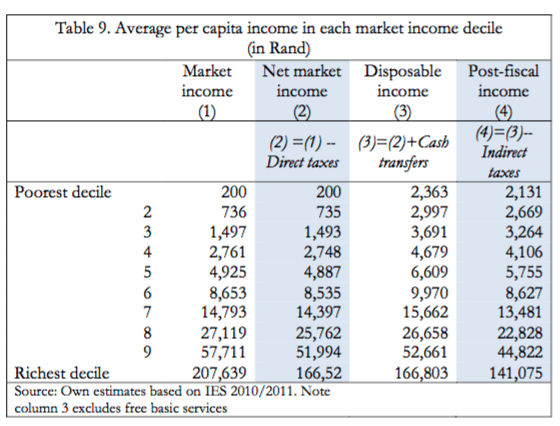 But what I am trying to say is that the talk around South Africa’s income inequality seems bizarre because it outrightly ignores the impact of the policies that are currently in play to reduce it. And surely that has to count for something? PS: I do realise that I’m talking about income inequality rather than wealth inequality. I will write about wealth inequality again – but basically, I suspect that wealth inequality is a far trickier beast, mainly because it seems far more likely to reverse itself over time – which I wrote about in this post: When Land Reform Works, and When It Reverses. PPS: also, apologies for the confusion with yesterday’s post. I published the original post, then the WordPress app on my phone unpublished it, and then when I re-published it, it reverted to an earlier incomplete draft. I’ve finally corrected it now (I hope!) – but very frustrating. Something you dont see much of in the “Mainstream” media. Also not something the EFF will be using in their campaign speeches! So where would that adjustment put us internationally? I would say it’s a brilliant piece but it’s really just facts. The sad part is that because you lay out the facts, you’re immediately different from the mainstream. Why does nobody look at the facts before jumping to conclusions? Great piece.